Here are our top picks for the best home stereo systems you can find that deliver superb sound quality, detailed stereo separation and very good sound quality. These home stereo systems are capable of providing an excellent home audio listening experience with enough volume to fill up your entire living room, and some of them also support Bluetooth streaming with AM/FM tuning. Our experts have tested many stereo systems to determine which ones provide the best value for money and very detailed sound quality. If you are looking for a home stereo system for music listening, these home audio systems definitely come highly recommended. The Sharp XL-BH250 is one of the best home stereo systems you can find and comes with versatile suite of functionality including Bluetooth, USB for mp3 playback and AM/FM audio. The sound quality that you get with this audio system is superb, with clean treble ranges, good midrange and decent bass response. The stereo system comes with two left and right speakers that provide detailed stereo separation and good music quality. It has a digital AM/FM tuner with 40 presets and works with CDs, WMA and mp3 sound formats. The main channel speaker inputs supports audio line-in and USB connection. The system also comes with Bluetooth streaming which is great if you want to stream music directly from your smartphone device. We also like the fact that these speakers come with a headphone output and remote control for easy setup. Overall, the Sharp XL-BH250 is a really good home stereo system and delivers superb sound performance for home audio entertainment. We were very surprised at how good the Sharp XL-BH250 stereo system sounded straight out of the box. The sound performance from these speakers was very detailed and crisp. Treble ranges sounded bright and nicely defined without any harshness; the bass performance on these speakers hits hard and goes pretty deep. Listening to classical music with this home stereo system felt like a very immersive experience, with crisp notes and good stereo separation. This provides good stereo imaging which allows you to get a sense of where each music note and instrument is coming from. Vocal performances sounded crisp and elaborate without any shrill – it feels as though you are sitting in a real life concert hall while listening to these speakers. You can also crank up the volume on these speakers and they can fill up a large living room with powerful sound without any distortion. While these speakers lack some bass response without a dedicated subwoofer, they produce high-fidelity sound that really captures the details of the music. The sound quality was consistent when playing music through USB or AM/FM radio connection. The Sharp XL-BH250 has a pretty sleek design that blends in nicely with modern home interior décor. The 5 CD micro system allows you to switch between multiple soundtracks at a time; the remote control also provides a nice added touch to change volume and soundtracks on the go. The AM/FM tuner works like a charm and we were able to rake in multiple radio stations without getting any static interference. The Bluetooth connectivity works well when streaming music wirelessly from mobile devices. You can also plug in a headphone through the headphone output to listen to music if you don’t want the music to blast out at home. The speakers are nice and compact enough to be placed on a bookshelf without looking too obtrusive. The volume controls and LED display at the front are also well positioned and very intuitive to use. All in all, a very solid home audio setup that provides great musical sound quality with good volume. 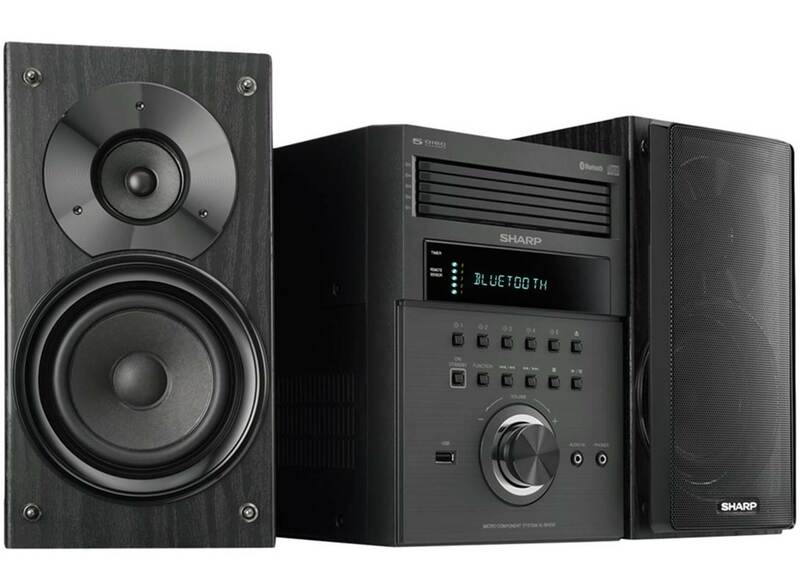 The Sharp XL-BH250 home stereo system provides very good sound performance, detailed stereo separation and volume. The sound quality of these speakers is top-notch and they provide top-quality sound with crisp highs, good midranges and decent bass response. The bass response hits hard although the system may benefit from the addition of a dedicated subwoofer. Music performances including vocal solos sounded right off the bat exquisite, with good attention to detail and instrumental separation. We liked the fact that it comes with a 5 CD micro system design that allows you to change between artists easily. The USB and Bluetooth connectivity also works like a charm and allows you to play music at home via mobile device. The AM/FM radio tuner comes with 40 station presets and allows you to set your favorite channels for one-touch recall. The entire system comes with two main channel speaker inputs, one audio line-in and a USB input. It also outputs sound to your headphone if required. Overall, it’s a highly versatile home stereo system that delivers a very good combination of sound quality and functionality and comes highly recommended. The Sony CMT SBT 100 home stereo system delivers great sound performance and very good value for money. The system is capable of delivering 50 watts RMS of power with an S-Master amplifier to drive the dual 2-way bass reflex speakers. It also comes with Bluetooth audio streaming capabilities with AAC and aptX compatibility for high quality music streaming. The speakers also has NFC pairing and come with a full AM/FM/CD music system for home audio. The system has a classic design that blends in nicely with home interior décor and looks pretty sleek – it is compact enough to be placed on a TV table top or bookshelf. The entire home audio system has enough power to fill up a large living room with rich and filling sound with good stereo imaging. If you are looking for a home stereo system that can deliver pristine sound performance with a sleek and modern design, the Sony CMTSBT 100 comes highly recommended. The Sony CMTSBT100 delivers superb sound performance and very good value. When we tested these speakers, we were quite surprised at how much power the system can output while setup on a bookshelf or table with consistent sound quality. You can crank up the volume on these speakers and they can fill up a large room with rich and filling sound without any distortion. The highs and midrange are crisp and clear, and the sound has characteristically bright overtones. The sound quality is pretty consistent across a wide variety of music genres – classical music sounded very good with these speakers with plenty of stereo imaging and instrumental separation. Vocal performances had a degree of presence which made it feel as though were sitting in a real life concert hall. That being said, the sound quality of these speakers is best when the volume is set above 20. The bass response on these speakers is tight and punchy due to the 2-way bass reflex design which is a great added plus. Overall, the Sony speakers pump out pretty solid sound performance and clean tonal clarity. The Sony home stereo system has some pretty effective features that make it easy to use. The Bluetooth streaming on these speakers works great with mobile devices and we did not experience any dips in sound quality while streaming music. We also liked that the system has simple bass and treble adjustment knobs which help to tune the music according to your EQ settings. It comes with a nice remote control for easy use although all the functions can be easily accessed from the main console. The system comes with a CD player as well as AM/FM presets which you can program to listen to your favorite music stations. It also comes with USB connectivity, a rear 3.5mm input jack and a headphone output jack if you want to listen to music at home without disturbing others around you. The USB port has 2.1 charging capability so you can even charge your iPad or mobile device with it. The NFC connectivity works great straight out of the box and remembers the last paired mobile device. The LED visuals at the front of the speaker console are simple to read and look very nice. The Sony CMTSBT100 home stereo system is one of the best stereo systems that provide great sound quality with wireless Bluetooth streaming combined. The sound quality that you get from these speakers is very consistent through many music genres, with crisp highs, detailed midrange and good bass response. It pumps out a good 50 watts of power with full AM/FM radio capability together with USB and Bluetooth streaming, which makes this a really versatile home audio system. Music performances sounded very crisp and well defined, with decent stereo separation and good bass response due to the 2-way bass reflex design. The system also comes with a 3.5mm audio input jack at the back of the speaker and a headphone output jack in the front. The remote control is also pretty handy and intuitive to use. It’s a system that works well straight out of the box and provides great value for home audio listening. Overall, the Sony home stereo system is a really versatile and modern looking stereo speaker set that delivers good quality sound and comes highly recommended. 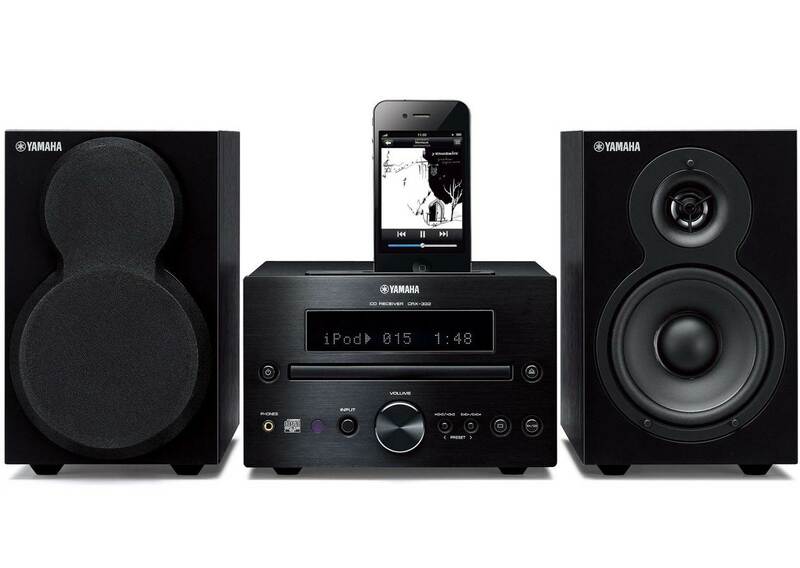 The Yamaha MCR-232BL home stereo system is a really high quality system that delivers exceptional stereo sound performance for home audio entertainment. The speaker comes with a modern looking design with two 2-way bass reflex speakers for deeper sound performance. It comes with Yamaha’s VCCS technology which ensures that the speakers accurately reproduce the sound from the main unit without any distortion or static interference. The speaker system comes with analogue audio inputs and outputs, a 1/8” stereo mini input and supports USB audio. It also has subwoofer output and auxiliary-in terminals. It is also fully compatible with iPod, iPhone and iPad devices. The system also has an AM/FM tuner with CD player functions. We like the fact that the Sony twin speakers come with elegantly designed removable speaker grilles which enhance the overall aesthetic appearance of this system. Overall, the Yamaha MCR-232BL is a really good home stereo system that delivers great sound quality and a whole suite of versatile functionality. The sound output and quality from the Sony home stereo system is outstanding. It delivers a far superior listening experience compared to other stereo systems with near high-fidelity sound performance. The speakers are not as large as a full blown stereo system but they produce life-like sound quality with distinct clarity. Listening to classical music sounded as though we were sitting in a real life concert hall with very good instrumental separation. The sound that you get through these speakers is smooth and sweet; at low volumes the clarity of the sound remains consistent and the tonal response is phenomenal. You can really crank up the volume on these speakers to high volume levels and the sound will remain crystal clear and well-defined without any hint of distortion. We were quite surprised by how much bass these speakers can produce when we ran electronic dance music and rock music – the bass goes very deep and strong even without a dedicated subwoofer. Overall, the sound quality of these speakers is best described as rich, clear, refined and well-balanced. The Sony home stereo system has a relatively sleek and unobtrusive design that blends in nicely with modern home interior décor. The matt black finish on the receiver and the wooden finish on the speakers looks simply amazing. The speakers come with a remote control which is really convenient if you need to change soundtracks or adjust the volume. It also has bass, treble and balance controls which is great to adjust the EQ settings. The subwoofer output on this system is a nice added touch in case you want more bass – you can get a dedicated subwoofer for this system. The main console supports USB input and iPod digital dock and supports mp3 as well as WMA file formats. The system comes with analog audio inputs and outputs for easy connectivity. That being said, the only downside to these speakers is that it does not support wireless Bluetooth connectivity. We liked the fact that the Yamaha home stereo system comes with elegant removable grilles which flush into the background. It’s a really nice speaker system to have at home on the shelf or in the living room table. The Yamaha MCR-232BL is a really good home stereo system that delivers quality sound performance with a really elegant design. We liked the fact that the MCR232 comes with matt black speakers that show the grain of the wood and looks really nice with modern interior décor. The speakers provide excellent sound quality with its 2-way bass reflex design with crisp highs, good midranges and a stunning amount of bass. We did not experience any dips in sound quality or distortion when turning the volume up to maximum – the sound quality remains consistent and very well defined. Musical performances sounded crisp and vivid, with detailed instrumental separation and good soundstage. The system also comes with a subwoofer output to add a dedicated subwoofer for more bass if necessary. While this system lacks Bluetooth connectivity, the sound quality and design of these speakers really makes up for it. Overall, the Yamaha MCR-232BL is one of the best home stereo systems you can find with refined sound performance, so don’t forget to check it out! 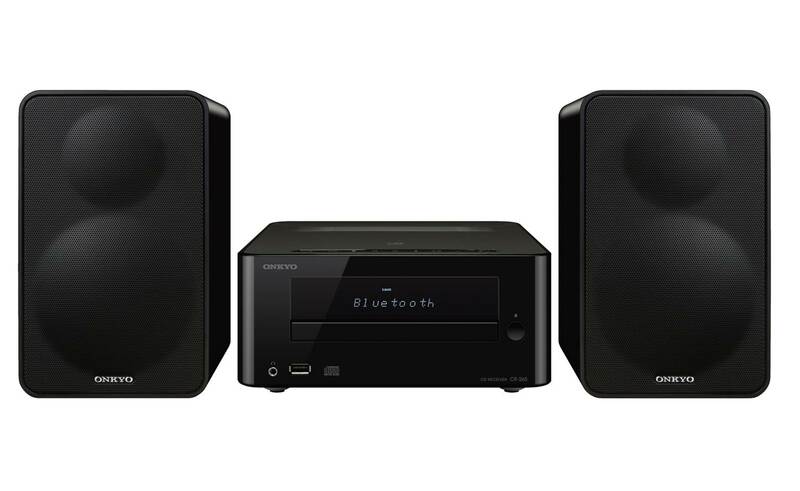 The Onkyo CS-265 is a really good home stereo system that delivers excellent stereo imaging and sound quality. It is engineered to deliver 20 watts per channel and comes with full digital audio processing with a digital amplifier for balanced stereo sound. The entire system comes with Bluetooth 4.0 for wireless music streaming and NFC pairing to connect quickly to your mobile device. The main console is capable of supporting audio CD, CD-R, CD-RW and mp3 encoded CDs. It also features a front-panel USB port to connect to iPhone or iPad devices or other USB flash drives, as well as an anolog audio input for external devices. We liked the fact that this home audio system comes with 2-mode super bass function to enhance the low-end frequency response, as well as 3 playback and repeat modes for CD. It also comes with good tonal controls for treble and bass output and bass presets to allow you to adjust the EQ settings according to your preferences. If you are looking for a really solid home stereo system with great hi-fi sound, the Onkyo CS-265 comes highly recommended. The sound performance of the Onkyo CS-265 was much better than expected. The entire system is pretty compact in size but is capable of pumping out 20 watts per channel with a maximum input power of 30 watts. The sound from these speakers is clear, with crisp highs, nice midrange tones and low bass response. The bass on these speakers sounds pretty good although you may wish to add a dedicated subwoofer to this system to enhance the bass impact. Where the Onkyo system really shines is in the level of stereo imaging which it provides – you can clearly distinguish between the left and right speaker channels and get a sense of where the music is coming from. Listening to classical music with this system feels like sitting in a real life orchestra. The sound and tonal ranges is consistent at almost all volume levels and the system does not produce much distortion at high volumes. It’s a great home audio system for listening to radio and CD soundtracks and produces really balanced stereo sound. We absolutely loved the sleek and modern design of the Onkyo CS-265. It’s a home stereo system that can be placed on the desk or bookshelf and blends in nicely with modern home interior décor. The USB port works great and connects to iPhone and other mp3 player devices easily. We liked the fact that the speaker console comes with Bluetooth 4.0 for wireless music streaming and NFC connectivity. The CD player is compatible with audio CD, CD-RW and mp3 encoded CDs for versatile playback; it has a sturdier CD tray which loads CDs quicker than other stereo systems we have tested. It also comes with an analog input for external devices at the back of the speaker. The system has a 2-mode super bass function which you can use to enhance the lower-end frequency ranges, and a 3 playback mode for CD which includes normal, random and repeat modes. The radio works like a charm on the Onkyo system and pulls in a good variety of radio stations. All in all, the Onkyo CS-265 provides excellent sound quality and high quality music playback from CD and mp3 sources and is a really good system to have for your home audio. The Onkyo CS-265 is one of the best home stereo systems we have tested that really delivers sound performance on par with higher end systems. The sound quality that you get from this system is really detailed, with very nice treble and midranges, crisp tonal clarity and good bass response. It also comes with a full digital audio processing console and a digital amplifier for clear and balanced stereo sound; it provides 20 watts per channel and an input power of 30 watts. It comes with a great CD player which supports audio CDs and CD-RW formats (mp3 and WAV encoded files) and plays them very nicely with consistent sound quality. The CD loader works very well and loads the CDs quickly, which makes them really convenient to use for home listening. We liked the fact that the system also comes with tonal controls for treble and bass and a 2-mode super bass function which provides deeper bass response. 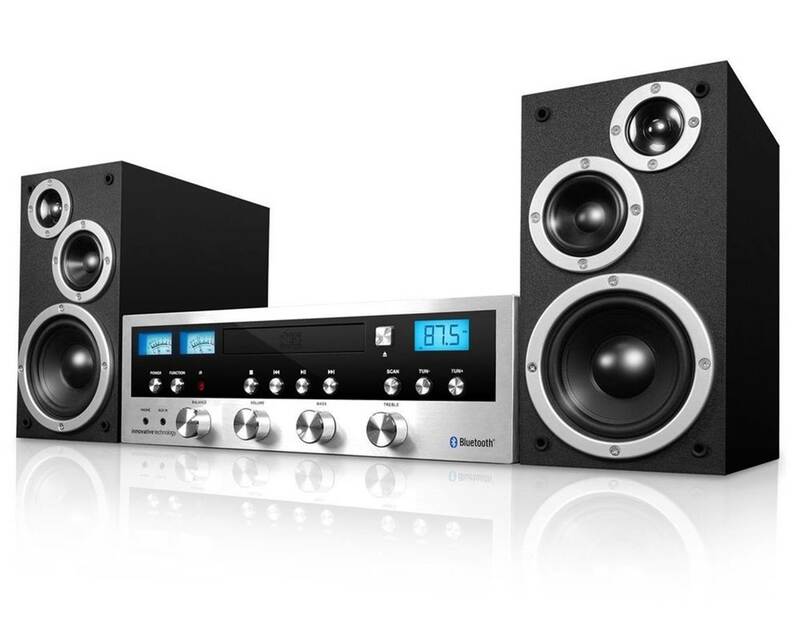 Overall, it’s a really solid home stereo system that you can find for any music genre and we highly recommend them. The Sharp XLHF102B is a really good home stereo system that delivers very good bass performance and crisp stereo sound. The entire system consists of two speakers and a main control unit which delivers a total power output of 50 watts. It supports USB input with mp3 and WMA playback, together with Bluetooth audio streaming which allows you to stream music wirelessly from your mobile device or tablet. The USB input is great for playing music from a thumb drive or android device. The main console comes with a built-in CD player with AM/FM radio tuners which is great if you want to listen to radio stations at home. It also comes with a remote control and a programmable playback LCD with dimmer, together with bass boost and X-Bass controls for optimal low-end frequency response. The entire system looks very modern and intuitive to use. Overall, we really liked the Sharp XLHF102 hi-fi home stereo system and highly recommend them. We were quite impressed by the sound performance of the Sharp home stereo system. The sound from the speakers is loud and full without any hint of muddiness in the bass. The highs and midranges were crisp and well defined without any harshness; the bass on these speakers hits surprisingly hard which makes rock and electronic dance music genres much more enjoyable to listen to. We liked the fact that this system comes with the bass boost and X-Bass functionality which increases the lower end frequencies. The bass hits hard and feels solid and does not sound muddy or bloated. It also comes with a subwoofer output in the event that you need to connect a subwoofer to the system. We also tested this system with radio AM/FM stations and the sound was good and consistent without any distortion at high volumes. Music performances from the CD player sounded sublime and very well defined, particularly for vocal performances. The vocals were sharp, clean and very smooth. We liked the stereo separation on these speakers which gives good sonic imaging and provides a decent sense of where each music instrument note is coming from. In terms of the functionality, the Sharp XLHF102B comes with a CD player, Bluetooth wireless streaming capability, headphone output, AM/FM radio and a remote control. The entire system looks really sleek and modern and it also comes with a programmable playback and LCD screen with dimmer control. The bass and treble controls are easy and intuitive to use; the bass boost feature is also great for listening to bass-heavy music genres. The Bluetooth connectivity works like a charm and we did not experience any dips in sound quality while streaming music from our Bluetooth device. The main console also features two auxiliary inputs – a traditional RCA at the back of the console and a 3.5mm input at the front. We really liked the design and construction of the Sharp system – it comes with a metal case on the main unit and the metal grills on the speakers which are made of solid MDF material. This prevents cabinet resonance at higher volumes and reduces total distortion. Overall, it’s a pretty solid system that delivers great sound performance and we highly recommend them. 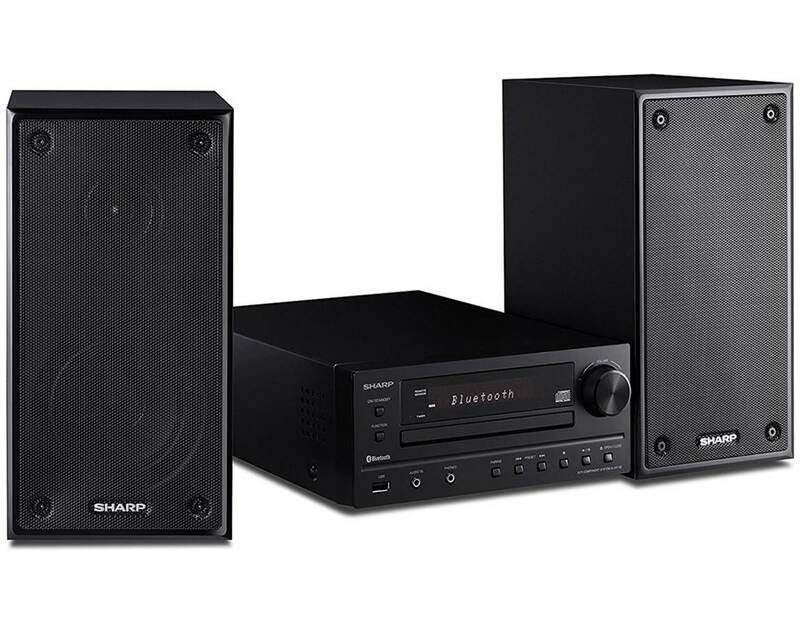 The Sharp XLHF102B is a really good home stereo system that delivers deep bass performance and quality sound. The vocals and instrumental music performances on this speaker is top-notch, and you get very nice stereo imaging which provides a good sense of where the sound is coming from. The speakers have a 2-channel configuration and the main unit supports CD audio, USB input with mp3 and WMA playbacks, AM/FM tuners and Bluetooth connectivity. The Bluetooth connection works like a charm and we were able to pair and stream music directly from our mobile device without any issues. The system has a really sleek and modern looking design that blends in nicely with home interior décor and fits nicely on the bookshelf. It also comes with a remote control for easy tuning. While it’s not as loud as the Onkyo speakers, it delivers great stereo sound and deep bass response with the bass booster functionality; the sound is consistent and does not distort at higher volumes. Overall, it’s a really good investment for a home stereo system and we highly recommend them. The Philips BTM2180 is a really solid home stereo system that delivers great sound quality with a wide suite of versatile functions. It comes fully equipped with wireless music streaming via Bluetooth and supports iPhone and android devices. The system has a maximum power output of 70W RMS at 30% THD or 50W at 10% THD. The micro system also plays music from CDs, CD-R/RW and USB flash drive inputs, together with an audio-in for portable music playback. We liked the fact that the speakers come with a built-in bass reflex speaker system which delivers deep bass response; it comes with a bass pipe that is acoustically aligned to the woofer to enhance low-frequency ranges and reduce distortion. The main console also comes with digital sound control functionality which allows you to choose your EQ settings top optimize frequency ranges for your personal music styles. 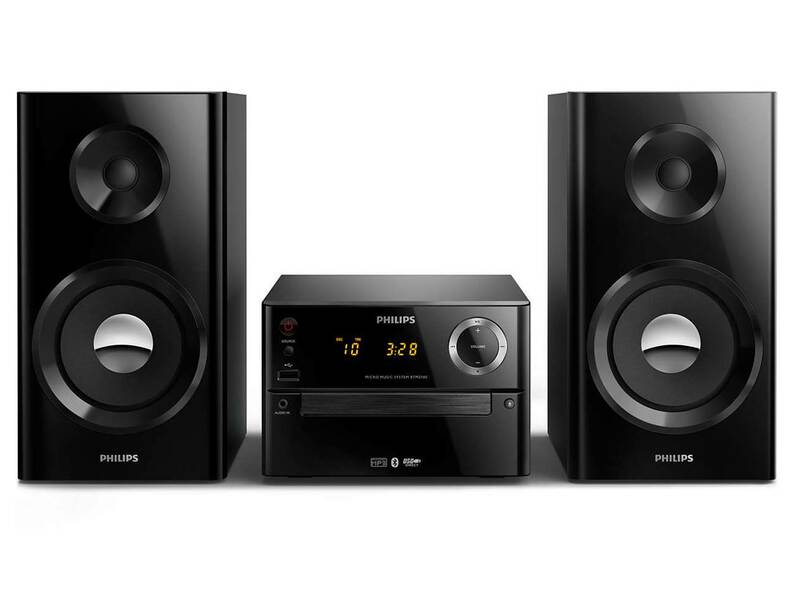 If you are looking for a home stereo system that will deliver great sound with a versatile setup, the Philips BTM2180 is definitely the one you should consider. We really enjoyed the sound performance of the Philips BTM2180. The sound from these speakers is loud and clear, and did provide good volume for the rated watts. You can really crank up the volume on these speakers without getting much distortion which is good – the sound quality remains consistent from low to high volume levels. We did not hear any harshness or tininess with these speakers. The sound signature on the BTM2180 is well-balanced, and covers the entire audio spectrum nicely with crisp highs, detailed midranges and good bass response. Instrumental performances sounded distilled and clear, with very good attention to detail. The stereo imaging with these speakers is great and you can tell where the music is coming from; the stereo separation between the left and right channel speakers is pretty clear. Vocals sounded smooth and delightful; you get the sense that you are sitting in a real life concert hall while listening to the system. The sound quality from Bluetooth streaming is consistent and clear without any lags. Where the BTM2180 system really shines is how versatile it is. It comes fully equipped with Bluetooth streaming for your to stream music directly from your smartphone or tablet devices. The system also supports mp3-CDs, CD-R/RWs formats as well as a USB input. The speakers have a built-in bass reflex speaker that enhances the low-frequency response – it comes with a bass pipe that is acoustically aligned to the woofer to optimize the bass roll-offs in the system. This produces more controlled bass with lower distortion. The system comes with built-in USB and audio-in connectivity for you to plug in your portable mp3 player into the system to play music on the go. The main console comes with digital sound control which allows you to adjust the EQ settings – each mode uses graphic equalizing technology to adjust the sound balance output according to the chosen preset. The speakers also come with dome tweeters which reproduce crisp highs and detailed midrange frequencies, and accentuate the vocal and instrumental clarity. The entire system looks very modern and sleek and blends in nicely with home interior décor. The Philips BTM2180 is a really solid home stereo system that comes with all the built-in functionality that you need for a great home audio experience. The sound performance that we got from these speakers is consistent and clear, and we really liked the tonal clarity and balance that these speakers bring to the table. Music performances sounded crisp and clear and rock and pop music genres also had an added punch due to the bass reflex design. The stereo system comes with audio-in connectivity as well as USB direct inputs, and Bluetooth wireless streaming. This is really convenient if you need to connect multiple music sources to this system while listening to music at home. The main console looks very modern and comes with a sleek design which blends in nicely on the table or on a bookshelf. We also liked the ability to change EQ presets to match your listening preferences. It comes with a CD player which is compatible with CD mp3 files, CD-R/RW formats. Overall, the Philips BTM2180 is a really solid home stereo system and definitely comes highly recommended. The Innovative Technology home stereo system is a really good speaker system in the mid-tier range that has a good combination of audio quality, design and functionality. The system comes with built-in Bluetooth to wirelessly play music directly from your Bluetooth mobile device or tablet without any wiring. It also comes with a built-in CD player with full function remote control which allows you to adjust the bass, treble and balance controls. The main console looks really sleek with brushed aluminium knobs that blend in nicely with home décor. The entire system can deliver up to 50 watts of stereo sound and also comes with removable speaker grills and dual VU meters for a classical stereo experience. We liked the fact that the Innovative Technology console comes with digital PLL FM radio with 20 presets and a bright backlit blue display which looks really nice. It also comes together with a 3.5mm auxiliary-in for playing music from non-wireless music sources. If you are looking for a really solid home stereo system in the mid-tier range, the Innovative Technology definitely hits the sweet spot between sound quality and functionality. The sound performance of the Innovative Technology stereo system was pretty good straight out of the box. It comes with a nice Class-D TDA-7492P amplifier which delivers 25 watts per channel and pumps out good volume. The sound from these speakers sounded really powerful and clear, with crisp highs and a good amount of bass. The tweeters produce pretty sweet highs although the midrange frequencies sounded slightly recessed. Vocal performances sounded crystal clear and lifelike, with good stereo imaging and separation between the left and right channels. Instrumental music sounded very well-defined with great attention to the individual instrumental notes. The speakers handle bass heavy music genres such as electronic dance music and rock surprisingly well with deep bass notes that hit hard. At 50 watts max, this stereo system is capable of pumping out enough volume to fill up a large room with rich and filling sound. You can also crank up the volume to close to maximum and get very little distortion, which is great. The only downside is that the bass and treble controls only have +/- 3db which is rather limited. The Innovative Technology stereo system looks really sleek and has a nice modern appearance with polished aluminium knobs on the main console. It blends in nicely with modern home interior décor. The digital PLL FM radio with 20 presets works like a charm and pulls in radio stations easily. The entire system provides real 25 watts per channel with a maximum output of 50 watts which is not bad. The Bluetooth connectivity works like a charm and streams music consistently without any dips in sound quality. The built-in CD player works well with music CDs although it does not play mp3 CD-R/RW formats. The remote control that comes with this system works just as intended and you can also use it to control the Bluetooth. The console has two auxiliary jacks (3.5mm on the front) and RCA inputs at the back. The speakers come with removable black covers which can be removed to expose the silver ring around the speakers for a more retro 70s look. The VU meters look pretty nice which start to liven up once the volume is turned up from 15 upwards. Overall, it’s a pretty neat setup for a home stereo system although there is some room for improvement. The Innovative Technology system is a really nice home stereo system that can deliver a good 50 watts of power with a retro 70s look. We liked the fact that this system comes with built-in Bluetooth which allows you stream music directly from your mobile device on the go. It also comes with a remote control, programmable CD player and adjustable treble, bass and balance knobs on the main console to optimize your listening experience. The entire system comes with a whole suite of functionality including FM radio, auxiliary-in, headphone jack, and removable black speaker grilles. We liked the dual blacklit VU meters which look really retro and unique. The FM radio functionality works very well and we were able to pull in a wide range of radio stations on the go. The speakers are powered by a powerful Class D TDA-7492P amplifier which provides a solid 25 watts per channel, which is more than enough power to fill up a large room with music. If you are looking for a classic looking home stereo system that delivers good sound performance, this system is definitely worth checking out. The Blackweb BWA16AA is a really compact and well-designed home stereo system that can pump out a good 100 watts of high definition sound. The stereo system comes with a top-loading CD player which you can use to play audio CDs and double as a bookshelf speaker. It also comes with digital FM radio which can pull in a large number of radio stations effectively for a pleasurable listening experience. The speakers also have LED which light up and provide a nice blue color hue. The speaker console supports a variety of source modes including Bluetooth, CD and auxiliary connection for non-wireless music sources. The stereo system comes with an FM radio antenna which you can position for better reception. The speakers have a really sleek and polished black finish design that blends in very well with modern home interior décor. While it’s not the best sounding system on the market, it definitely looks really sleek and packs a punch with decent audio performance. The sound quality of the BWA16AA stereo system is good considering the compact size of these speakers. The speaker system comes with EQ settings which you can tweak although we would suggest adjusting the EQ directly from your Bluetooth smartphone device for better results. The volume control on this speaker has a maximum setting of up to 30. You can crank up the volume up to the 25 setting mark although anything higher at this point may start to produce some degree of distortion. Music performances on this system sounded loud and clear, with pretty good attention to detail. The entire system has 100 watts of power output which is more than enough to fill up a large room with filling and rich sound. Instrumental music sounded particularly good on this system, with crisp highs, detailed instrumental notes and good stereo separation that gives you an idea of where the instrumental notes are coming from. Vocal performances sounded sweet and well-defined without any harshness. 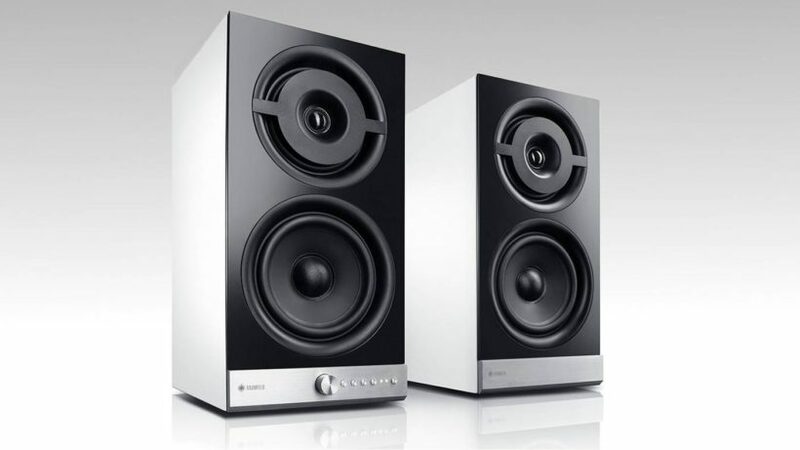 The bass on these speakers hits pretty well although we got much better results after adjusting the EQ settings – it works decently for bass-heavy music genres such as electronic dance music and rock. Where the Blackweb BWA16AA really shines is in the design. It comes with a polished black exterior and is compact enough to fit on a bookshelf. The speakers are uniquely shaped and designed and blend in perfectly with modern home décor. The LED light up function on these speakers adds an extra layer of aesthetic appeal to its modern design. 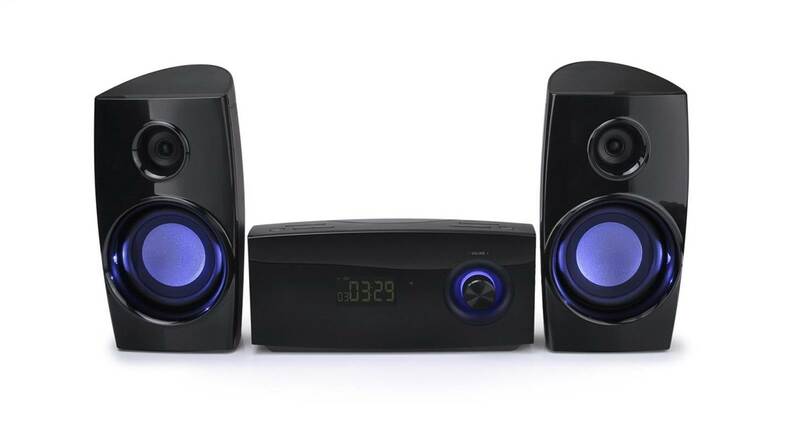 The Bluetooth connectivity on this system works like a charm and we could stream music directly from our mobile device to these speakers without any issues; the sound quality is consistent throughout. It pulls in FM stations relatively well although you might have to get creative about where to place the radio antenna. The speakers perform well with a variety of music genres including jazz, house music and pop. The bass response is pretty good although it may start to produce some distortion near to maximum volume levels. The Blackweb BWA16AA is a really decent home stereo system that provides pretty good sound performance in a compact and elegant package. The speakers have a really modern looking design with polished black exteriors that blend in nicely with modern home interior décor. It also comes with an LED light up function which enhances the overall aesthetic appeal. The main console is compact and comes with a small volume knob control which you can use to adjust the sound. The system also comes with a remote which you can use to adjust soundtracks and volume settings. The sound quality that we got from this setup was decent with nice highs and plenty of bass response; the volume on these speakers can go pretty loud up to a maximum setting of 30. That being said, we found that the speakers may start to distort a little from 25 upwards, which is something to take note of. The wireless Bluetooth streaming and digital FM radio works like a charm and we were able to pull in a wide variety of music stations without getting any static interference. If you are looking for a really well designed home stereo system, the Blackweb BWA16AA deserves a closer look. The Sony MCHE619iP is one of the best home stereo systems we have tested that delivers really solid sound performance with 120 watts RMS of power. The entire system is designed to produce crisp room filling sound that will certainly add a punch to your home audio listening experience. It is good enough to rival larger and more complex stereo systems in a compact setup. The speakers feature a 2-way bass reflex design that enhances the lower end frequency response; the main console interface comes with input and output terminals together with a 8-pin plug for iPhone devices. The speaker system comes with an integrated dock which provides convenient charging and playback control for devices using the Lightning connector. It also features a convenient USB at the front to connect to USB thumb-drives and other compatible USB devices. The CD player is compatible with CD-R and CD-RW discs and mp3 files that have been recorded to these CDs. It also comes with a remote control and two AA batteries for convenient setup. If you are looking for one of the best micro systems that provides great value for money, the Sony MHCE619iP home stereo system comes highly recommended. We were seriously impressed by the sound performance of the Sony MCHE619iP system. The audio quality is crystal clear and goes really loud without any issues – you can really crank up the volume on these speakers without hearing any distortion which is great. The speakers have a rated impedance of 8 ohms and a total output power of 120 watts RMS which is enough to fill up a large living room with detailed and clear sound. Instrumental performances on this system felt as though we were sitting in a real life concert hall, with very clear stereo separation and well-defined notes. The stereo imaging that you get with these speakers is excellent and you really get a sense of where the music is coming from. Vocal performances sounded realistic and well-defined, with very nice tonal clarity that does not sound harsh at all. The bass on this system hits hard and sounds punchy without muddying into the midrange; it’s a really good system for home or gym use and can pump out punchy beats for a really enjoyable music experience. Overall, we were really satisfied with the sound quality that we got from this system. The Sony system looks really well-designed and blends in nicely with modern home interior décor. It comes with a nice iPod dock on the front with a lightning connector which is good if you want to use this system with newer iPhone versions. It also comes with a USB port for you to connect to USB thumb-drives or to older iPhone versions using the charge cable connector. It also comes with CD player which works nicely with CD-R/RW with mp3 files. The FM radio also works like a charm and we were able to pull in many radio stations without any static interference. We liked the fact that the system comes with a remote control for convenience – you can adjust the volume and skip soundtracks at a touch of a button. The speakers feature a 2-way bass reflex design to enhance the lower end frequency response – the end result is that you get more bass performance on these speakers without needing to adjust the EQ settings. 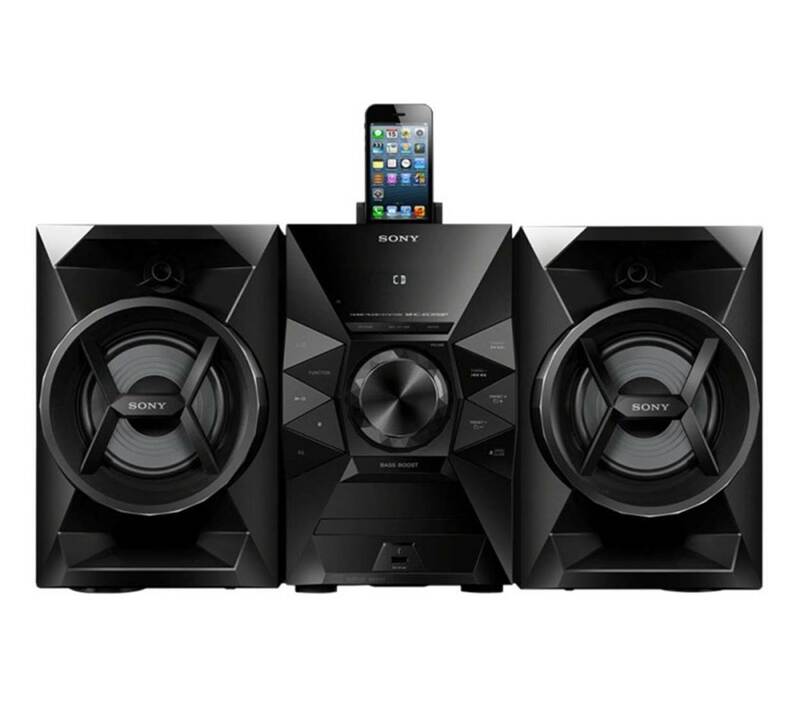 If you enjoy listening to bass-heavy music genres, you will definitely enjoy the Sony MCHE619iP system. 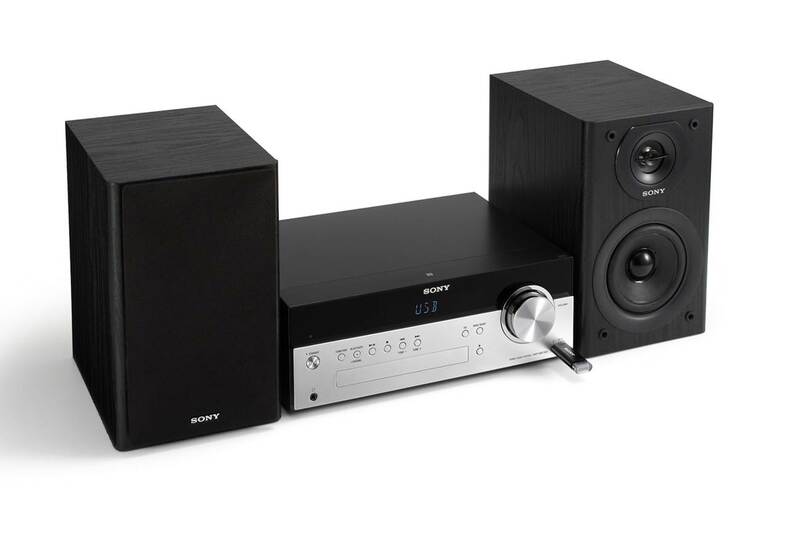 The Sony MCHE619iP home stereo system is a really good micro system that delivers superb sound quality. The entire system can deliver a maximum of 120 watts RMS and has enough power to fill up a large room with rich and filling sound. The bass reflex design on the speakers helps to enhance the lower end frequency response and add an extra kick to the overall sound quality. Vocal performances and instrumental music sounded extremely well-defined and very detailed; the stereo imaging on these speakers is superb and you can really pick out where each instrumental note is coming from. It comes with a lightning adapter on the main console to connect to new iPhone mobile devices, as well as a USB port for USB thumb-drive and other USB music storage devices. The CD player works as intended and the FM radio sounds great without any static interference. The only downside to this system is that it lacks Bluetooth connectivity and an auxiliary input jack. Apart from this, the Sony MCHE619iP is definitely a really solid home stereo system with great sound performance and comes highly recommended. The Panasonic SC-UX100 is a really powerful home stereo system that is capable of delivering a massive 300 watts of sound output. It’s the perfect stereo system for those who want to listen to music at massive volume levels. The speakers are stylistically designed and support wireless music streaming via Bluetooth, so you can stream music directly from your mobile device. The UX100 has an eye-catchy DJ Jukebox design which blends in nicely with modern home décor. The speakers have a 2-way bass reflex design to enhance the overall bass performance – it comes with a 13cm woofer and a 5cm tweeter for crisp highs and a 2-way design for a more expansive sound. The system also supports one CD player on the main console for audio CDs. The main console comes with a local preset equaliser for you to optimize sound performance according to your preferences and choose various preset modes like rock or instrumental music. If you are looking for a really powerful home stereo system with excellent sound quality, the Panasonic SC-UX100 is a great choice. We were pretty impressed by the overall sound performance from the SC-UX100. The speakers are pretty large and they can pump out a massive 300 watts of sound. They can pump out enough volume to literally shake your entire home; you can also crank up the volume on these speakers and they will not produce any distortion. The highs and midrange on the system is pretty well defined; the bass hits hard and has a solid low-end thump which is great for bass-heavy music genres. Listening to electronic dance music and rock/pop music on these speakers sounded crystal clear, with very good beats and natural vocal reproduction. The sound quality is smooth without producing any harshness. The system does come with preset EQ modes which you can use to adjust the sound output according to your listening preferences and get a much better surround sound effect. It also has a nice DJ effect with various party modes to choose from. The speakers do provide really nice stereo imaging and differentiate between the left and right speaker channels with clear details. The 3-band manual equalizer on the system definitely helps when you need to make custom adjustments to the sound. The Panasonic SC-UX100 looks really sleek with a matte black finish with gloss accents and blends in nicely with modern home interior décor. The speakers are relatively large and they are not exactly the kind of speakers that can fit easily on a bookshelf, so placing them on a table would be ideal. It comes with an app which you can install to program DJ and EQ settings using your smartphone. The Bluetooth connectivity on this speaker works like a charm and we did not experience any dips in sound quality while streaming music. We liked the fact that the speaker units come with a 13cm woofer and 5cm tweeter which does provide a nice low-end kick with a 2-way speaker design. The main console comes with a built-in equalizer which allows you adjust the audio frequencies. The volume knob in the centre of the console looks pretty neat and the controls are intuitive to use. The CD player on the SC-UX100 works like a charm with audio CDs and easy home listening. Overall, it’s a really nice setup to have at home with all the functionality that you need, although do bear in mind that this home stereo system is slightly larger than your average stereo system. 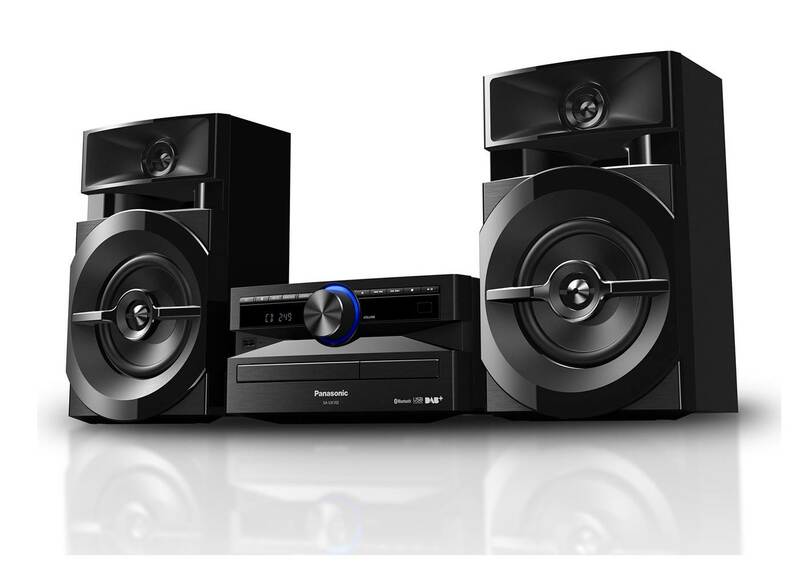 The Panasonic SC-UX100 is a really solid home stereo system that delivers up to 300 watts of maximum power. It produces enough volume to literally shake your entire home with crystal clear sound with good bass response. The speakers are equipped with a 13cm woofer to enhance the low-end frequency response; the highs and midranges are crisp and well-defined. Listening to instrumental music with these speakers was a really enjoyable experience, with great attention to detail and nice stereo separation between the left and right speaker channels. The stereo system has a really nice minimalist luxe design with a black matte finish and polished accents that allows the system to blend in nicely with modern home interior décor. We liked the fact that it comes with a CD player and Bluetooth connectivity for you to stream music from your mobile device on the go. The equalizer and preset settings on the main console are also useful to optimize the sound quality according to your preferences. If you are looking for a really solid home stereo system for an enjoyable listening experience with 300 watts of power, the SC-UX100 is definitely a great choice.